Padraig Harrington's return to form continued with a first round 69. 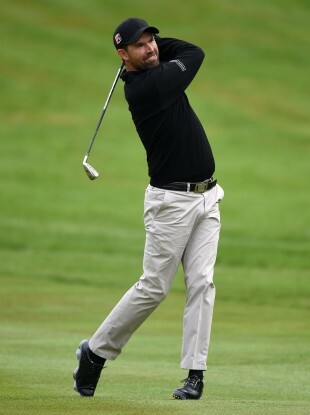 THOMAS BJORN LEADS the way at the European PGA Championship at Wentworth and only a spectacular round will knock him off top spot. The Dane recorded a masterful round of 62 after coming home in 30 shots. Bjorn’s opening nine was good but his closing stretch was great. He carded five birdies and an eagle on the par five 12th hole. Offaly’s Shane Lowry sits alone in second. He finished on -8 after 18 impressive holes. A threat of lightning forced play to a halt for over an hour but the delay mattered little to the Irishman. He holed birdie putts on 16 and 17 to nibble another two shots off Bjorn’s lead. There was a further delay of an hour before he parred the 18th to sign off for a round of 64. Padraig Harrington recorded an opening round of 69 on one of his least favourite courses. The Dubliner sank six birdie putts but also handed back three strokes with bogeys on seven, 10 and 16. He birdied the last and is currently [at 16:20] tied for ninth. Damien McGrane is -3 after five holes. European Ryder Cup captain Paul McGinley eagled the fourth to go -2 but could not find a birdie all morning. He eventually signed for a +2 round of 74. Martin Kaymer maintained his recent upsurge in fortunes by finishing at -4, along with Henrik Stenson and England’s David Horsey. South African Justin Walters is -5. Rory McIlroy was due to tee off at 1pm but the delay meant his round will not get underway until after 2pm. Email “Lowry and Harrington in the hunt at Wentworth as Bjorn scorches 62”. Feedback on “Lowry and Harrington in the hunt at Wentworth as Bjorn scorches 62”.